The footpath of the future may be much like the footpath of today, but for the way it's used. Start with the kerb, the edge of the footpath and the street itself. Kerb space is an extremely valuable asset. Driverless or autonomous vehicles could become a dominant mode in coming years in the emerging urban world. They will need to board and alight passengers at kerbs. Similarly, the rise of delivered goods requires more space to load and unload trucks. But today, kerb space is as often designated for on-street parking as it is for loading of goods, as a bus stop, as a taxi-stand, or as a protected zone for firetrucks. These uses are prescribed by regulations but there is a strong argument to be made that many of these regulations are poorly applied, or no longer appropriate given changing patterns of use and demand. Perhaps more often, the areas where they apply are poorly mapped or signed. Coord* is working on software for digitally mapping and standardizing the description of regulations for every piece of kerb real estate within a city, while Grid is developing systems for booking virtual loading bays in real-time. Tools such as these will allow users and governments to not only map where regulations apply, but measure their utility and, if appropriate, make a case for change to accommodate alternative uses to those prescribed. Kerb space, for one, is likely to be allocated less to parking (which is unnecessary in a taxi-based personal transport system) and more for loading. Historically sidewalks, the first path, have been used for people walking, sometimes for people moving goods, and occasionally for people on user-powered private vehicles such as scooters, skateboards, and bicycles. 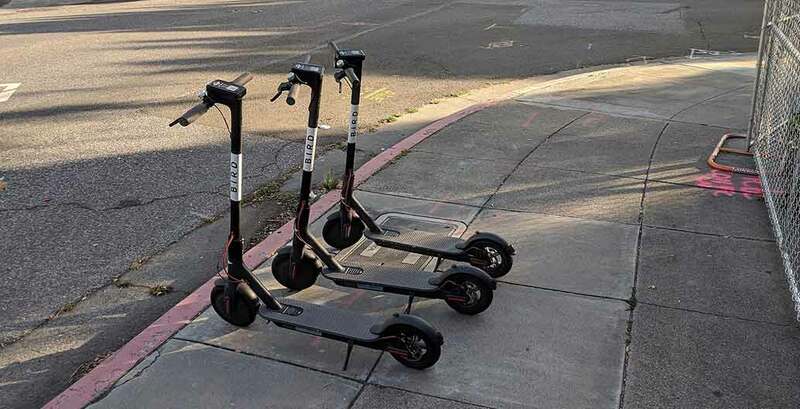 With the advent of the smart phone, new modes are becoming feasible, most notably dockless shared bikes and electric scooters. Regulations in many places limit the use of bikes on footpaths. The reasons for this are clear from the pedestrian’s point of view: bikes travel up to four times faster than walkers, and collisions can result in serious injuries, or even death in extreme cases. But throughout most of Australia, bike lanes are not provisioned, so bike riders have the Hobson’s choice of cycling in traffic with much heavier and much faster automobiles and trucks on the second path, the roadbed, or not cycling at all. The construction of paths for vehicles faster than foot and slower than cars, lying between the existing kerb and removing a lane of parking or car traffic, is the right strategy in most places, and one places not named Australia are building out. This third path is important not just for bikes, but for electric bikes (which are becoming increasingly feasible with progress in battery technology) and electric scooters. A fourth path for buses may also be needed. 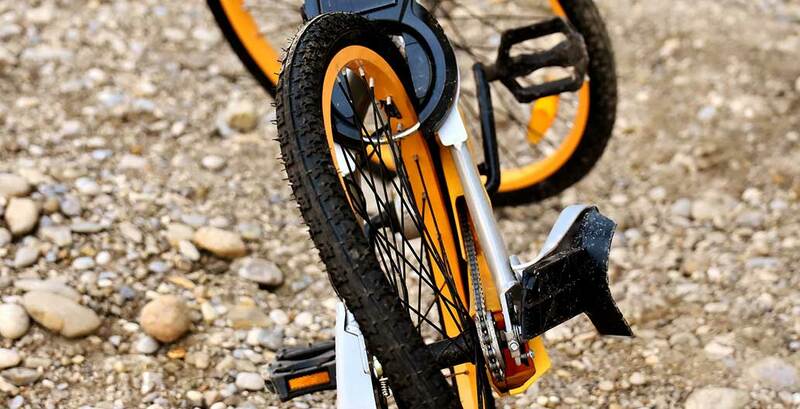 Today, most Australian media focuses on the new negative externalities associated with shared bikes – typically their storage or abandonment as clutter on sidewalks or in other public spaces. And this is a problem, but hardly insurmountable. Turn one on-street parking space per block into a corral for bikes and scooters (both shared and private), and this problem dissolves. But it’s not just passenger traffic that needs to be considered when it comes to sharing of the footpath. Starship is trialling delivery robots on sidewalks in a few cities. 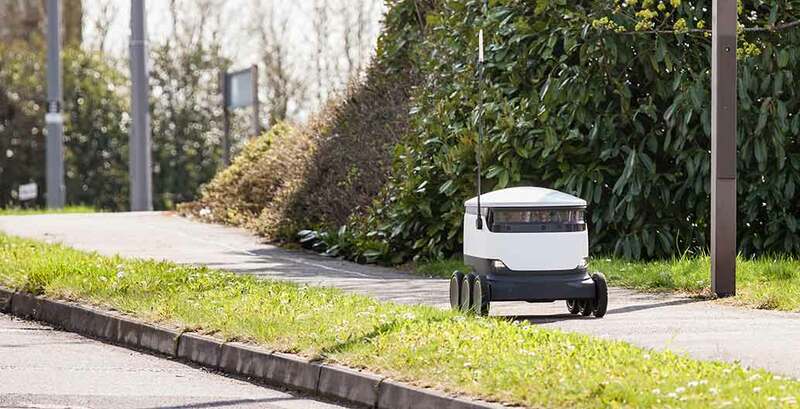 After notifying recipients of an upcoming delivery, a local Starship hub dispatches a robot, which rolls along the sidewalk at pedestrian speeds to the recipient’s building, where it waits at the door. The recipient unlocks the cargo via a smartphone, they secure their delivery, and the robot returns to base. Bikes and scooters (and robots) are hardly the only form of footpath clutter. Traffic signals, light poles, and road signs may make the sidewalk inaccessible for the disabled. Even good intentions get in the way. Bus shelters are misplaced across the walking path. Construction detritus, and especially construction signs for cars, are often temporarily laid across the walking track by unthinking contractors. If real time digitized information is standardized, this over-signing of our urban environment might finally come to an end. Usage data on sidewalks is almost non-existent now, typically relying on periodic counts conducted by interns. This is not for lack of technology (Placemeter, for example, has conducted real-time counts using computer vision for years), but for lack of funds and awareness. Counting pedestrians is an under-appreciated change. Systems cannot manage what they do not monitor, and the uncounted are ignored. 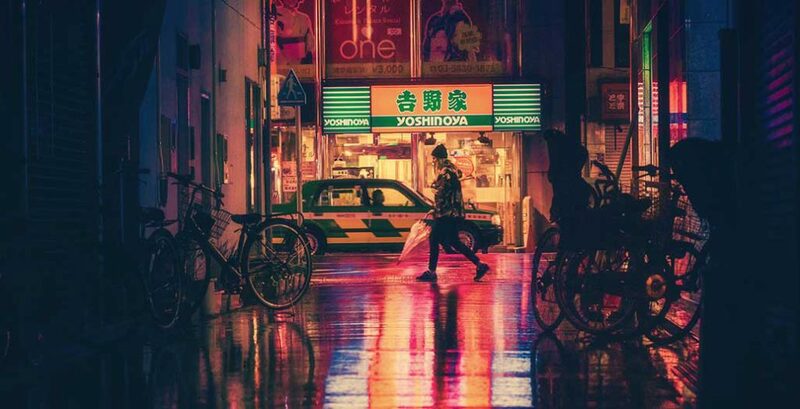 By counting people walking on sidewalks, their value can be recognized in the programming of traffic lights, which are now timed to favour counted cars rather than uncounted pedestrians. One outcome of monitoring sidewalk usage will be an awareness that many of today’s footpaths are not fit for purpose. They are both ‘functionally obsolete’ and ‘structurally deficient,’ to borrow language from bridge engineers. The continuous implicit monitoring of footpath quality by robots solves one of those problems: identification of failing pavements. While none of this information guarantees public works agencies will have sufficient funds to fix failed footpaths, it will provide information that, coupled with usage data, can be used to prioritize public expenditures on repairs and maintenance. While most of Australia is bereft of snow, automated snow clearance by robots, coupled with electrified sidewalks to melt snow and ice, is coming to colder areas as well. Many footpaths today are already functionally obsolescent, due simply to the fact that they’re not wide enough to accommodate existing requirements, let alone burgeoning future uses. With today’s clutter of signs, street trees, garbage and recycling bins, it is often already difficult for two people to safely pass on our footpaths, much less those with mobility impairments requiring wheelchairs (the curb cuts for wheel chair users to safely cross the street are surprisingly missing from many pavements around the world, Australia being one example, despite being common in the US for nearly three decades). These obsolete footpaths are often adjacent to streets that are too wide and lack a green verge. The multifunctional benefits of this latter low tech feature are well established, with green verges serving to buffer pedestrians from motor vehicles, provide pervious surface for rainfall to percolate into groundwater, and space for trees to grow, reducing excess urban heat and providing shade. There are numerous design solutions for rebuilding the footpath wider, with a nature strip or boulevard, but they do require taking space now allocated for cars. Designing cities for people on foot also demands raised crosswalks, as is common in many European cities, but scarce in Australia. Pedestrians should not lower themselves to the street when crossing the path of cars, instead cars should be slowed when passing the path of walkers, by rising up a slowing speed hump as they approach intersections. Will this slow the car? Yes, that is the point. Will it speed pedestrians? Yes, that is the point. Many streets can be converted to shared spaces, and with the addition of the soon to be ubiquitous bollard, pedestrian-only zones. Shared spaces permit all vehicles types at pedestrian speeds into a neighbourhood, and are far simpler than traffic calming, though it involves that too. The footpath is not just a place for moving, it is a place for standing and playing in dense urban environments. It acts as a canvas, for children to chalk or make hop-skotch games, for communities to draw for both politicking and fun. But, to deviate from this utopian vision for a moment, it is also a potential canvas for advertising, both political and commercial. Commercial advertising might help defray the costs of maintenance, just as an American pizza company is sponsoring potholes. The footpath of the future will be wider, with more people walking and ambling, some zoned into their own electronic worlds with AirPods in their ears and augmented reality iGlasses on their faces, others meandering and conversing and making eye contact with strangers. But all of these ‘eyes on the street’ keep communities safe, and keep communities communicating.